When Sri Krishna decided to end his stay on earth, it was time for Balarama, his elder brother, too to depart. How Balarama died is mentioned in the Srimad Bhagavata Purana. When Dwapara Yuga was coming to an end, Sri Krishna decided to put an end to his avatar. Soon Dharma (righteousness) started disappearing and it was replaced by Adharma. Yadavas, who were into merrymaking and wanton lifestyle, dressed up Samba as a pregnant woman and decided to mock the Rishis. They approached the rishis and asked them whether the woman would give birth to a girl or boy. The Rishis could not tolerate the behavior of the Yadavas and cursed them that he would give birth to an iron pillar, which would destroy the Yadava clan. Shamba soon gave birth to an iron pillar. King Ugrasena asked the iron pillar to be powdered and thrown into the sea. But the powder reached the shores and turned into iron reeds and which eventually led to the death of the Yadavas. Balarama who witnessed the end of the Yadava clan ended his life by his yogic powers at Prabhasa in Saurashtra (modern day Gujarat). (This is mentioned in the Srimad Bhagavata Purana). 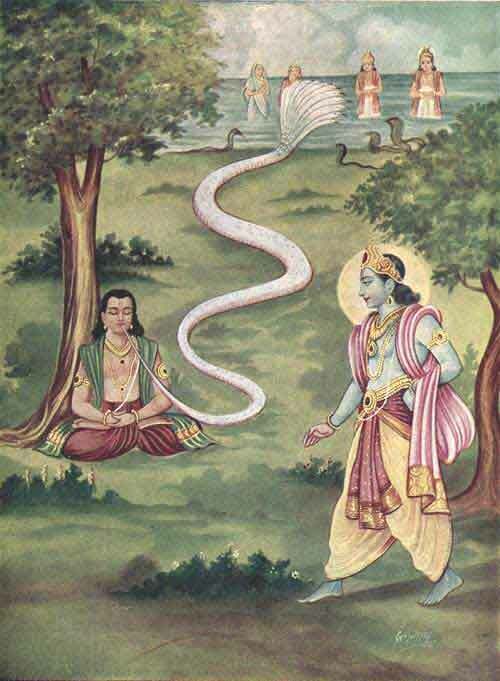 As per some scriptures, when Balarama sat in meditation a thousand headed white snake came out of his mouth. The snake is believed to have entered into a cave near the famous Somnath Temple. The cave it seems leads to Patala Loka or the netherworld. The white snake is Ananta Sesha. it is believed that Balarama was an avatar of Shesha Naag, on whom Lord Vishnu sleeps in the milky ocean.